Stopping your vehicle is a job most commonly associated with brakes. 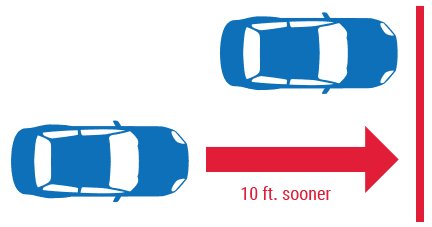 While your car’s braking system is the main component, several other factors affect your stopping distance. One of them is the status of your car’s alignment. If its suspension and steering systems no longer function at their intended angles, the result is rapid, uneven tire treadwear – the primary reason for requiring tire replacement. Independent testing demonstrates that your vehicle’s stopping distance can improve up to 10 feet when you replace your shocks or struts after 50,000 miles of use. In a 50,000-mile period, your car’s shocks and struts cycle more than 85 million times, which results in wear and tear on internal components. That wear and tear can compromise your ability to control the car due to reduced stability. Independent testing demonstrates that your vehicle’s stopping distance can improve up to 10 feet when you replace your shocks or struts after 50,000 miles of use. Most vehicles ride on coil springs. 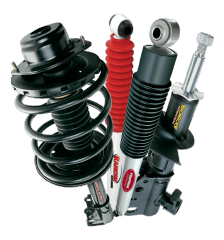 If your vehicle is designed with shocks, also known as shock absorbers, the spring is mounted between the wheels and the frame of the car. With struts, the coil spring and shock absorber is in one connected piece. Typically, vehicles have either shocks or struts, although some vehicles come equipped with both. You can see your vehicle’s shocks and/or struts at work when driving over a bumpy surface or patch of rough road, as it will bounce on the springs. Shocks and/or struts keep the vehicle from bouncing continually, making for a safer and more comfortable ride. Without shocks and struts, a car would bounce on the springs nonstop, making it extremely uncomfortable, hard to control, and potentially unsafe, as your tire surface loses contact with the road. To stay in control of your vehicle, your tires must always be in contact with the road. Speeding up, slowing down, taking a turn, or coming to a complete stop can all be negatively impacted if the tires and the road are not in constant contact. When Should You Have Shocks and Struts Serviced? Shocks and struts do not technically need to be replaced at specific mileage intervals, but they do wear out over time. There are multiple warning signs of failing shocks and/or struts that you should be on the lookout for. Of note regarding fluid leaks as they pertain to your shocks and/or struts. A little leakage is normal and will appear as a small, wet spot on the shock or strut. Problematic leakage will make the shock or strut appear wet and oily. Signs that your vehicle’s shocks and/or struts are worn can be easily identified by a Pep Boys certified technician. Have your car’s suspension system evaluated today.